TAM Airlines is the biggest airline in Brazil, and part of the LATAM Airlines Group, which was created when LAN Airlines merged with TAM in 2012. For the most part, the airlines still maintain separate operations, but they are slated to fully complete the merger in 2017. TAM currently flies to 67 destinations in 18 countries, including three cities in the United States: Miami, New York and Orlando. 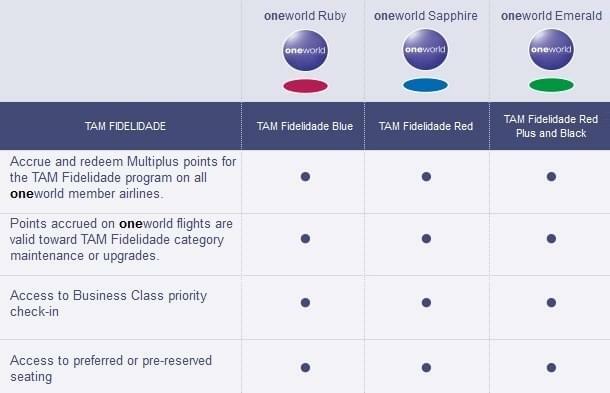 The carrier’s loyalty program, TAM Fidelidade, has a few excellent redemption options in its generally complicated and expensive award chart. The best values are for domestic economy awards within Brazil, and for flights throughout South America. How Can You Use TAM Fidelidade Points? You can use TAM Fidelidade points on TAM and LAN Airlines on its subsidiary TAM Airlines Paraguay and with oneworld alliance members. TAM also has several of its own partners, including ANA, Air China, Austrian Airlines, Brussels Airlines, Lufthansa, Shenzhen Airlines, Singapore Airlines, South African Airways, Swiss and Turkish Airlines. The best redemptions in the TAM Fidelidade chart are for domestic awards in Brazil. They cost 5,000 to 8,000 points each way. Considering that Brazil is the fourth-largest country in the world, this can be a terrific bargain. Award flights between Brazil and other South American countries are also a good deal. Tickets cost 7,000 to 10,000 points each way. Another valuable redemption is for flights between North America and Oceania, which includes Australia, New Zealand and almost a dozen South Pacific and French Polynesian islands. Tickets cost only 60,000 points roundtrip. All business and first class awards are overpriced. For example, a round-trip flight between the U.S. and South Asia costs 320,000 points in first class. You can use points to upgrade your cash ticket on TAM and partner airlines. You can only upgrade one class, from economy to business, or from business to first. Every level includes the benefits of the previous level. TAM Airlines does not offer a co-branded credit card for U.S. residents.